You are here: Home / Healthy and Happy / New Exam Rooms Designed to Reduce Stress! Our new room design with pet friendly ottomans. Turning Tables to Ottomans. We’ve replaced the bulky cabinets with more compact storage. Those slippery exam tables have given way to comfy ottomans. For the animals that prefer to stay closer to the ground, we have new yoga type mats. 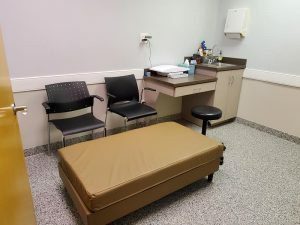 All the furniture is positioned with flexible seating options so that the client, the vet, and the pet are close together. The new configuration lends itself to pets being held by the owner, or for us to get down on the floor during procedures. 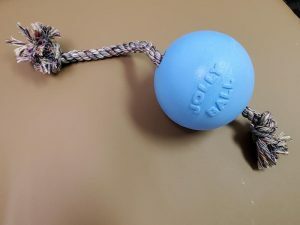 The Jolly Ball rope is just a fun toy for high impact chewers. Tunes, Toys, and Treats. To make your pets feel even more comfortable, we have treats and toys. You’ll be given a treat menu, so you can alert us of allergies that your pet – or you – may have. We have TUX toys, Hurley food puzzles, and even silicone mats that have holes that we fill with spray cheese or peanut butter, a great distraction during some of the more uncomfortable things that we have to do. You’ll probably notice that we have new music playing, but you probably won’t realize that the beat of the songs mimics the resting heart rate of a dog! And the changes are still coming – like a new cat room and an outdoor exam space. 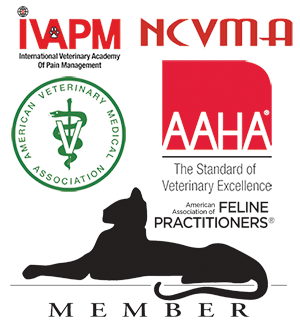 Stay tuned to learn about the other new things that we are doing to make your pets as stress free as possible during their visits to us.